Product prices and availability are accurate as of 2019-04-20 03:24:06 PDT and are subject to change. Any price and availability information displayed on http://www.amazon.com/ at the time of purchase will apply to the purchase of this product. The Stamina Airgometer Upright Exercise Bike utilizes magnetic air resistance technology that provides ample resistance to tone muscles and breeze to cool you off during workouts. This upright exercise bike features low resistance yet offers a total-body cardiovascular workout - you'll definitely feel the burn and revel in the results. Features Dual-action handlebars add intensity and tone arms, chest, shoulders, and back Foam-coated handlebars reduce sweat and enhance gripping ability Large textured pedals provide smooth pedaling capabilities and keep feet secure Stationary footrests offer comfort and workout versatility - isolate upper body if desired Oversized, padded seat adds comfort and offers 10 adjustment options for a just-right height InTouch Fitness Monitor: LCD display tracks time, distance, speed, and calories burned Two front wheels allow for easy portability Conveniently placed water bottle holder - water bottle included. Durable steel frame construction Machine weight: 82 lbs. ; Weight capacity: 300 lbs. Some assembly required Manufacturer's warranty included - see Product Guarantee Area for details Founded in 1987, Stamina is dedicated to building a stronger, healthier you. The company supplies high-quality products at excellent value to the fitness and leisure markets, showcasing hundreds of products around the world over the past two decades. Stamina is responsible for such brands as Body by Jake, Suzanne Somers, Tony Little, and more. Their mission is straightforward and admirable: Stamina strives to outperform the competition by maintaining effective communication, consistent quality, and superior service. They will continue to pursue perfection through the design excellence of these home fitness products. Assembled dimensions: 49L x 23W x 50H inches. Magnetic air resistance provides smooth, quiet ride. Multi-function console tracks time, distance, calories. Dual-action handlebars add upper body cardio intensity. 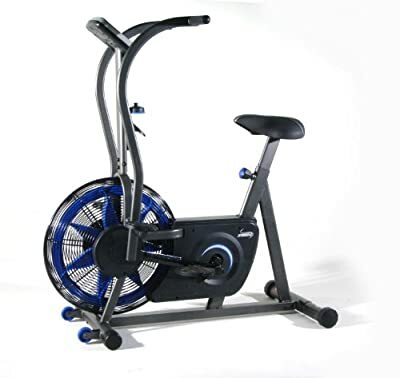 Assembled dimensions: 49L x 23W x 50H inches Magnetic air resistance provides smooth, quiet ride Multi-function console tracks time, distance, calories Dual-action handlebars add upper body cardio intensity Weight capacity: 300 lbs.